Hello! Couldn't you just kick yourself when you get rid of clothes only to have them come back in style a few seasons later? That's how I feel about vests. I just got rid of several vests, and now it seems that they are all the rage again. I have traditionally followed the philosophy that if I don't wear something for one year, get rid of it; however, I'm beginning to re-think that philosophy based on the number of clothing items I wish I still had. Maybe instead of disposing of old clothing, I will just put it in another closet till it comes back in style. I'll probably save a lot more money that way. 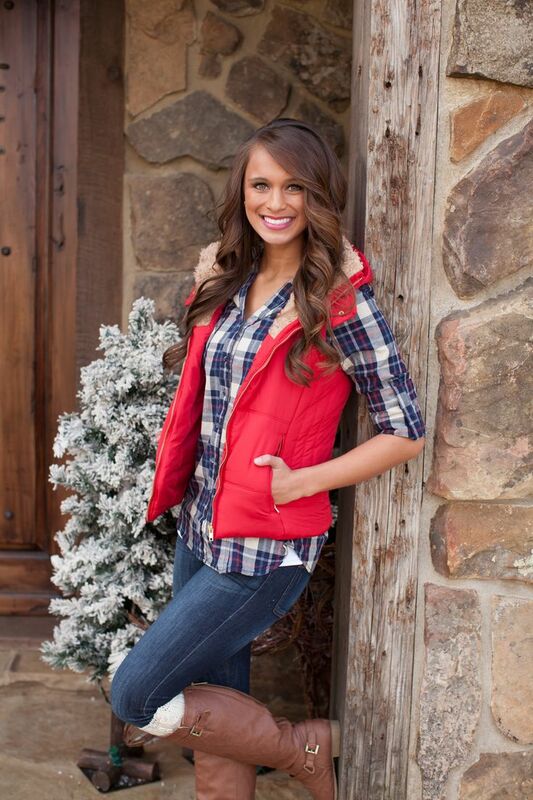 Puffer vests are very popular right now. They are pictured on all the fashion blogs and hanging in every store. 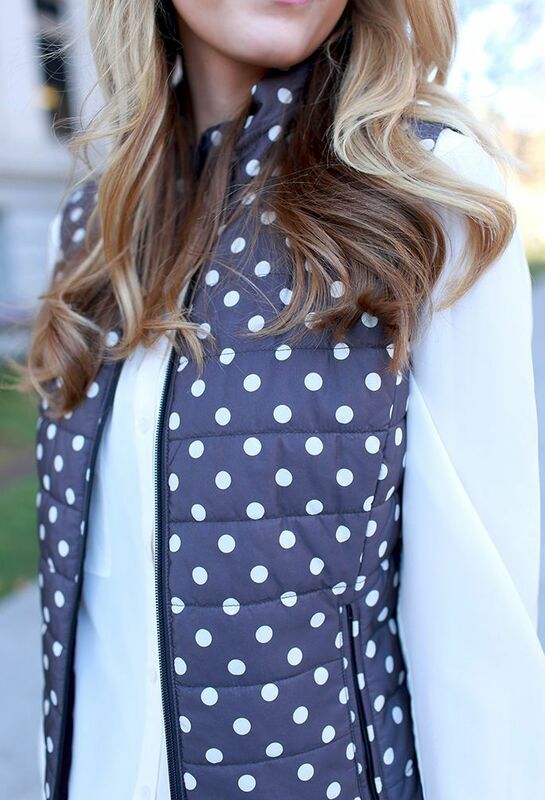 I've purchased two puffer vests this season, one in black and one in white. My black one is very thin and I usually just wear it around the house for extra warmth. This white one I wore on a rare warm winter day to go shopping. I find a vest is far more comfortable to wear than a heavy coat if your just running from your car to inside a building. I tend to get overheated with my down coat in if I'm in a store too long. Too keep me from getting too cold, I wore a chunky, burgundy knit scarf with my vest. It also added some much needed color to an otherwise blue and white ensemble. 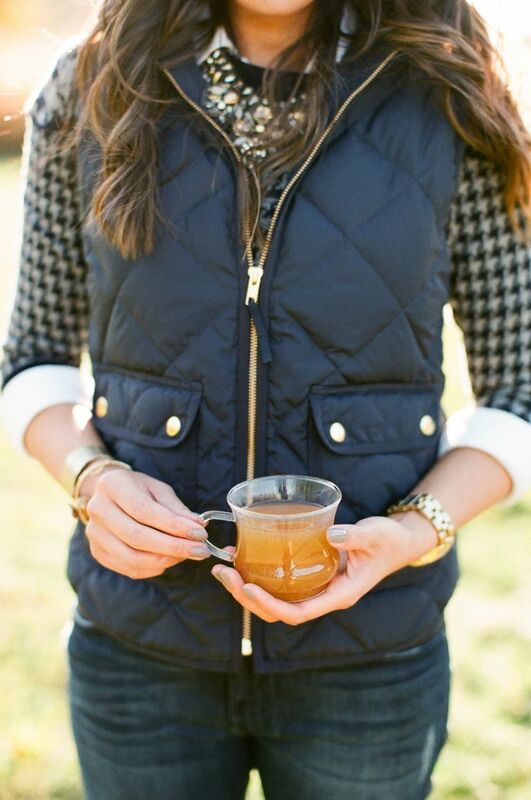 I bought my vest at Sears for only $14.99….the steal of the day! The grey hood is detachable, but why would I ever take it off? It's so cute! For jewelry I wore a winter charm bracelet and an early Christmas gift from my husband….a Pandora ring. Isn't it pretty? I love Pandora jewelry. It's so well made, yet affordable. I wore my very old Express skinny jeans which tore when I put them on. Can you see the little hole in the upper right hip area? I've worn them so much, I've started to wear them out. Since having holes in your jeans is so popular right now, I decided to wear them anyway. Maybe I'll get lucky and get a few more holes! LOL! My striped shirt is from Stitch Fix. My boots are old. I bought them last year from Famous Footwear. 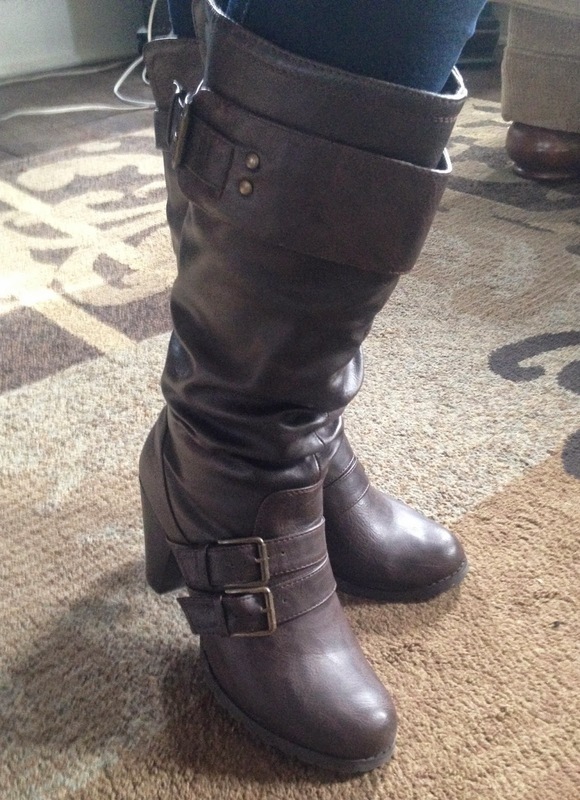 I love the color and all the pretty buckles and details in these boots. 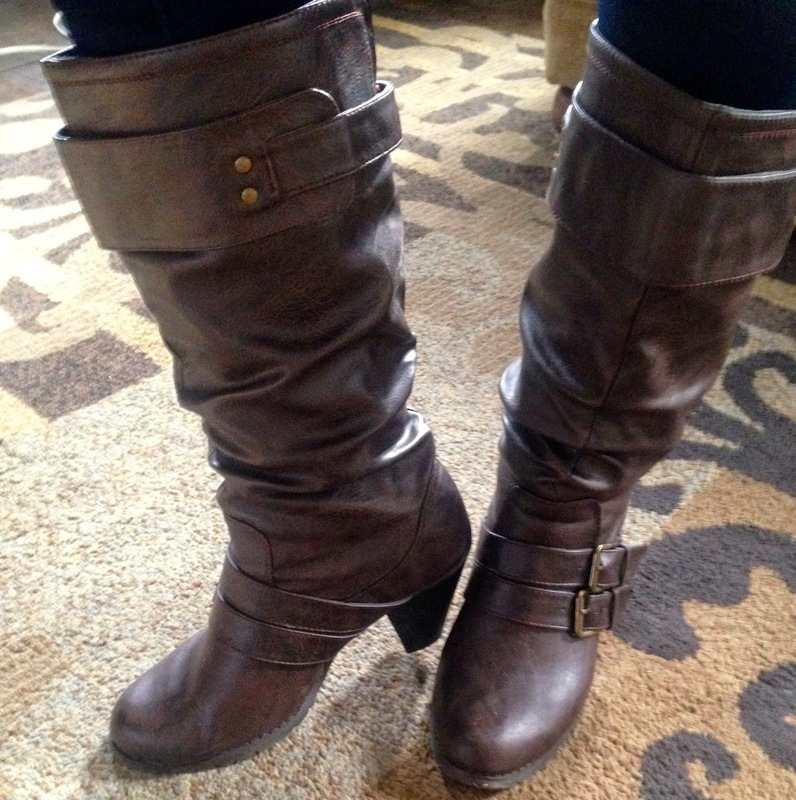 Flat boots are more 'in' this year than boots with heels, but since these are still in perfect condition, I just can't justify buying a new pair of brown boots. Yes, we came back 'inside' to finish photographing. The porch was too dirty to take close up pictures of my boots, plus, I was getting a little chilly. 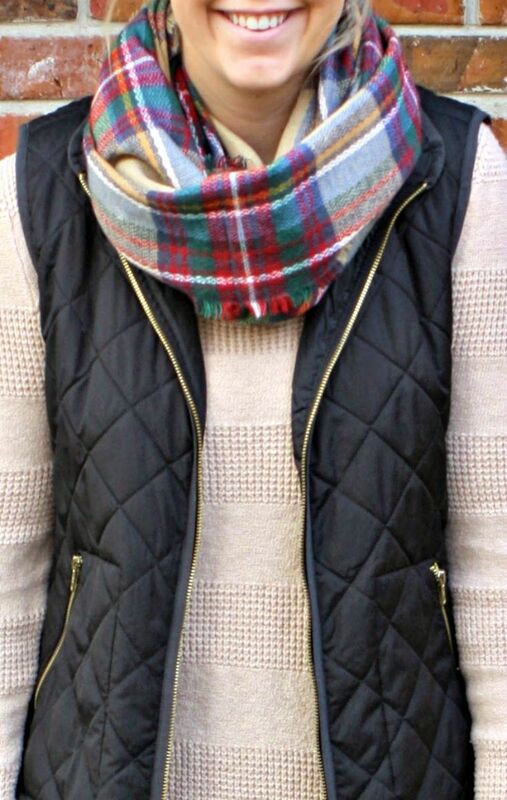 So which vest is your favorite? I'm really loving the red one and thinking, hmmn, should I get another one? This outfit looks really nice on you Amy. Love how the striped shirt goes with the white vest. And the ring is sooooo pretty! !